expeditions Archives | Untamed Borders - Adventure travel.. In July/August 2019 we will be heading to one of world’s most remote corners for a first ascent climbing expedition. Our 21 day journey will visit one of the world’s least visited corners of the Eurasian Continent, the Afghan Wakhan which borders Tajikistan, Pakistan and China. We will begin and end in Tajikistan’s capital Dushanbe before travelling along the dramatic Pamir Highway and crossing over into Afghanistan. We will then pass through the Wakhan Corridor to the Afghan Pamir. You will spend 12 full days attempting two unclimbed mountains, Peak 5396 and Peak 5721. You’ll also have the opportunity to meet Wakhi nomads who graze their livestock here during the summer months as well as seeing ancient tombs and Buddhist engravings, which live as a reminder of this once great section of the Silk Road. We head straight out of Dushanbe (800m) driving along the Pamir Highway towards the town of Khorog (2100m). We will overnight in Kalaikhum (1600m) before taking a rest day in Khorog, nestling on the banks of the Panj River. We will stay overnight at a local homestay and begin to acclimatize to the mountains and explore this typical Tajik town of the Pamirs. Please note – if we need visas for Afghanistan for any of the group we go straight to Khorog in one long day and have a rest day in Khorog. It is however strongly recommended that you obtain your Afghan visa prior to the start of the trip. We will drive to the border town of Tajik Ishkishim and cross over into Afghanistan. Once in Afghan Ishkishim we will spend the majority of the day in town with our guide, making the final preparations and collecting our permits for the Wakhan region. After that we will continue to the Wakhi village of Qazideh (2600m). Once we have left Ishkishim we will have to be self-sufficient for the remaining weeks and we need this day to ensure we have everything arranged. The road is poor and can be washed out in places but we hope to make it in one long, but scenic day of driving. The 120km from Qazideh to Wuzed (3000m) takes us along a narrow section of the Wakhan Corridor. Passing the 7492m high Noshaq, Afghanistan’s highest peak, we will follow in the footsteps of Marco Polo and Hsuan Tsang on this ancient Silk Road route. We will have to stop in the village of Khandud to process some further paperwork. Afterward we’ll drive eastward past the village of Qala e Panja and toward Sast, which is across the river from Wuzed. It’s here that we’ll acquire our pack animals and porters. On our way up from Wuzed to the Wuzed Pass Shepherd Camp (3900m) we may meet Wakhi shepherds bringing their flocks back to the bigger villages for the winter. Our local guide has friends amongst the Wakhi and if we are fortunate we may have time to meet and talk with them. We hope to exchange ideas about the world and to get an insight into their lifestyle and culture, living in yurts in this remote spot, high in the Pamirs. We will depart from the Shepherd Camp and venture further up the valley to our main base camp at Wuzed Pass Pond Camp (4400m). You will have a free day to relax, walk and acclimatise. Doing so will ensure you are well adapted to the rigours of climbing at altitude and put you in the best position for attempting the peaks safely and efficiently. A day will be spent exploring the local area and scouting out the approach and route up to the unclimbed Peak 5396, our first objective of the expedition. A very early pre-dawn start will see you make your attempt on the virgin summit of Peak 5396. After summiting you will return back to your base camp at Wuzed Pass Pond Camp. Day 10 Wuzed Pass Pond Camp – Yurt Camp for Peak 5721. From Wuzed Pass Pond Camp we’ll move over to a Wakhi yurt camp (4150m) in the vicinity of Peak 5721. On this day there will be the option to rest for the day whilst others in the group go for a recce of a suitable advanced base camp (ABC) for the following day. After breakfast you’ll head for Peak 5721’s ABC (4800m) and prepare the following two days of climbing. You’ll venture out with the team above ABC to search out for a potential route to the summit the following day. Today is another big day as you make your attempt on the first ascent of Peak 5721 and then return to ABC for the night. We will pack up our camp and begin our two-day journey out of the mountains to Sargaz (3100m), first stopping for the night at the foot of Sargaz Pass (4800m). In the morning we will ascend over Sargaz Pass and then make our descent down to the village of Sargaz, which is further east of Wuzed. If the weather is clear you may be able to see peaks on the other side of the valley (along the Pakistani border), as well as other unclimbed peaks further into the interior of the Wakhan near the Tajik border. Return from Sargaz to Qazideh by road. You will be dropped off at Dushanbe airport. A deposit of US$400 per person is required to reserve your place on this trip. If you have any questions regarding this itinerary or about Afghanistan in general, please contact us. snow patches, and knee-deep rivers. on ice, descending with crampons, be comfortable with height/exposure, ascending a fixed rope (if required)*** and experience using both a single axe and two technical axes. on local weather and the conditions on the mountain at the time. to ascend the rope comfortably using 2 x ascenders or prussiks. Lastly, for all participants with a serious interest to join, you will need to provide us with a basic CV of your previous climbing/mountaineering/trekking experience. One of the international guides for this trip will arrange to have an informal chat with you beforehand to share with you more about the trip and answer any questions you might have regarding the required level of experience. We do not directly arrange international flights to Tajikistan. We run our Wakhan trips to coincide with the regular Turkish Airlines flights from Europe to Dushanbe, which is the most practical route into Tajikistan. You can also contact the Untamed Borders dedicated team at Flight Centre for other suggested routes. You will need a double-entry Tajikistan tourist visa with GBAO permit and an Afghan visa for this trip. We will assist with advice on how best to obtain these visas as visa requirements vary from country to country. We recommend you apply for the Tajikistan e-visas as this is the fastest and most efficient method. If a double-entry Tajikistan visa is not available at the time, you can apply for 2 x single entry tourist e-visa, provided they each have a different ‘valid from’ date. The Wakhan and Afghan Pamir regions are both very remote areas in one of the least developed countries in the world. Please ensure that your insurance covers you both for visiting Afghanistan and for rescue in the Wakhan region of Afghanistan. If you have any questions about which insurance company to select please contact us. Outside of Dushanbe options will be limited and once we are on the trek we will only be able to eat what we bring with us, or barter for from the nomadic people. Any specific allergies or dietary requirements can be accommodated if we are given prior warning. If you have a particular preference for snacks to eat whilst climbing (such as protein bars), we strongly suggest you bring your own personal supply. The accommodation will be based on 2 people sharing a room when that is available. When we are in the Wakhan area we will be staying in tents and in local guesthouses that sometimes only offer central communal areas to sleep in. We always check the vehicles we use thoroughly before each trip. In Afghanistan we aim to use four-wheel drive vehicles and take with us a satellite phone should the vehicle develop a fault. When we choose our vehicles and drivers we take into consideration the road conditions, the length of journey and the competence of the man behind the wheel. Your comfort, enjoyment and safety of the journey is the first priority. 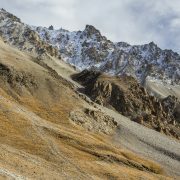 For this trip we use team leaders from Untamed Borders who have experience of guiding in the Wakhan and Greater Ranges. In addition to these experienced leaders we will be working with local Wakhi guides and porters. Trips to Afghanistan do create dangers all of their own and whilst we want you to have as much freedom as possible we must state that the tour leader has the final word with regards to changes in the itinerary for safety reasons. Whilst the route we have chosen passes through areas that we consider to be relatively stable things can change and we may have to alter the route or cancel sections of the trip at short notice.